The simplest of designs, these wrap around dresses were a staple of 1920's wardrobes. 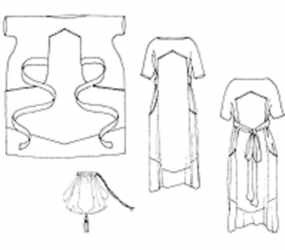 Known as a 'walking dress' or 'housedress', they were worn on casual occasions during Prohibition A drawstring purse was a common accessory. #N174 Two piece outfit with short sleeved Flat panel dress with inset panels and belt and draw string purse.